But there's one part of the contrast that will be tricky to make. Watch how Democrats handle change versus the status quo. Hillary Clinton is an insider running in a outsider year. Hillary Clinton is the most unpopular candidate to ever run for president — other than Donald Trump. To change that, the Democrats will have to provide a contrast to the GOP hatefest and Clinton will have to present a positive case for herself and her agenda. This is Clinton's big challenge. She comes into the convention with a majority of voters saying she is not honest or trustworthy or likable. Her approval ratings have been on a steady decline ever since she left the State Dept. and became a politician again — and she's really been hurt by the FBI director's stinging assessment of her "extreme carelessness" handling classified information. She might not be able to reverse voters views of her honesty but she might be able to make herself more relatable with testimonials from President Obama and Bill Clinton and a speech of her own that shows she's warm and approachable — the way so many people say she is in small groups or one-on-one. Donald Trump promised a convention full of showbiz. But he didn't deliver. Sure there was his WWF entrance with the smoke machine and backlit silhouette but there just weren't that many sports heroes or celebrities in Cleveland. The Democrats are determined to do better than Turmp in the entertainment department. They've got Snoop Dogg, Katy Perry, Keisha, Lady Gaga, The Roots and Fergie. Then there are the political stars — President Obama, Michelle Obama, Elizabeth Warren and Bill Clinton. Donald Trump is a one man band, with few personal validators beyond his family, his employees, and Chris Christie. Hillary Clinton has a whole chorus of democratic luminaries singing her praises. 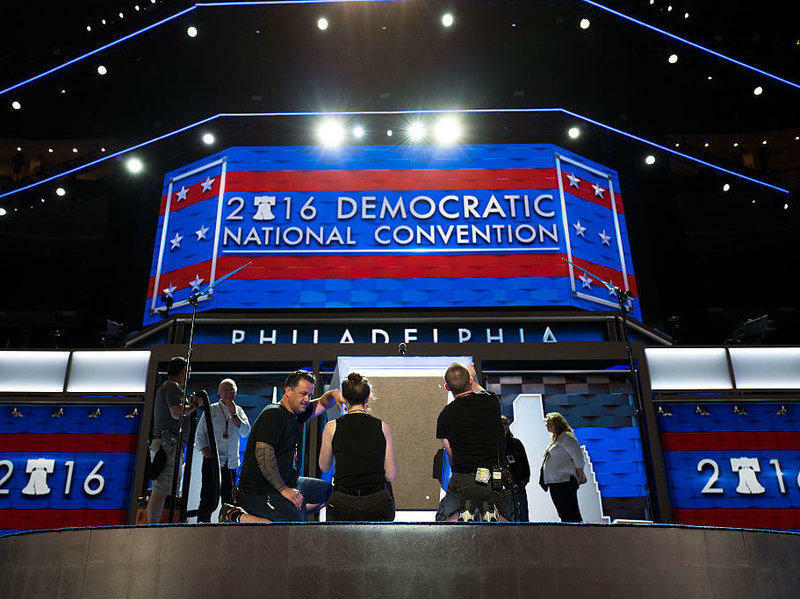 The average convention poll bounce for Democrats since 1964 is 6.8 percent; for Republicans, it has been 5.3 percent, according to Gallup. Sometimes a candidate gets no bounce at all. Romney didn't in 2012. But sometimes they get a big bounce. Bill Clinton did in 1992 — a whopping 16 point bump after his convention in 1992. In a year when both candidates are so intensely disliked, that seems unlikely — but even a little improvement in her image would help a lot. The bottom line result of four nights in the Quicken Loans Arena was the consummation of the party's union with Donald J. Trump, its new master and presidential champion. The coming together was never going to be easy or smooth. It was a match made not in heaven, but in the hot flames of the party's debates, primaries and caucuses.